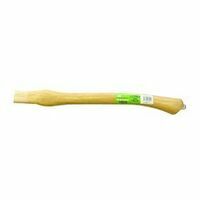 Vaughan Replacement Handle, Hatchet, Suitable For Use With: FixAll Framer 19 oz Curved Handle, 17-1/2 in Adze Eye Each handle comes with the required wedges, rivets, or epoxy needed for proper application to the tool head. Quality level codes are: 02- best quality American hickory with a wax finish, 04- better quality American hickory with a wax, 19- better quality American hickory with a clear lacquer finish and 09- promotional grade handles, American hickory. Each handle comes with the required wedges, rivets, or epoxy needed for proper application to the tool head. Quality level codes are: 02- best quality American hickory with a wax finish, 04- better quality American hickory with a wax, 19- better quality American hickory with a clear lacquer finish and 09- promotional grade handles, American hickory.